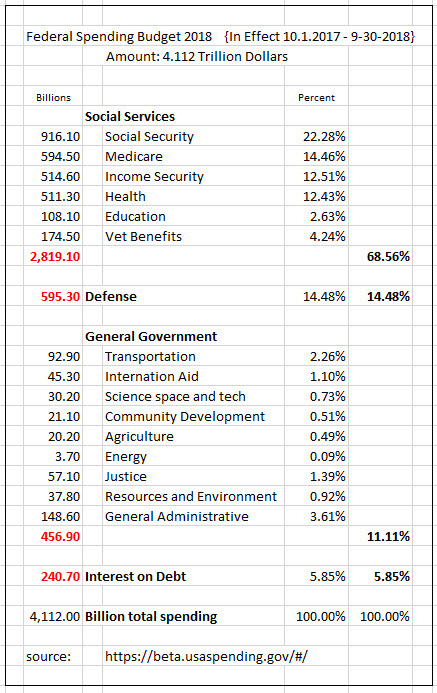 The US Federal Government runs its income/outgo on its spending budget and revenue plan. When the President presents his budget, and when Congress approves the final, it's for all the money, all the spending, all the revenue. For FY 2018, that's $4112 Billion Dollars. The distinction between "mandatory" and "discretionary" spending is strictly nomenclature – all the revenue comes into the US Treasury bucket, all of the spending goes out from the US Treasury. The notion that revenue received from a given source is "earmarked" for specific spending is also nomenclature. Any trust fund, such as for Social Security, is a "balance sheet transaction," meaning the US Treasury makes a debit/credit swap to move the asset around from one account name to another, but no money is actually transferred, and there is no separate fund in a bank somewhere 'holding' the SS trust fund. Current Social Security and Medicare recipients receive money straight from the US Treasury, paid by money collected from current taxpayers this year. We Don't Pay for Everything by Taxes! This page does not break out the revenue plan. However, the projected number is 3.459 Trillion. With spending at 4.112 Trillion, the deficit will be $653 Billion. We'll have to borrow that. And incur interest on it next year. The summary to the right is taken directly from the Federal Government website cited on this page. Please check it. You can click on categories to investigate the targets for spending in each category. This website is provided by John Donohue. I am concerned for my country. The numbers are scary. It's trouble. And I did not bring up this: we are $20Trillon in debt. Send comments to comments@mil14.com and I will print intelligent and civil letters below.